Gina McCarthy doesn't flinch when she's handed a Guinness before noon. 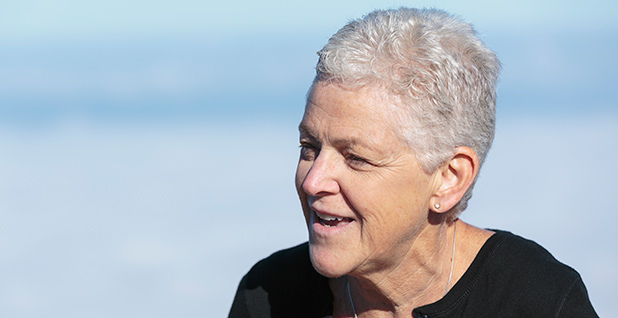 The former U.S. EPA boss recently sat down with E&E News to discuss life after the Obama administration and her disappointment with President Trump. She's moved back to her native New England, and she's been teaching at Harvard University, giving speeches and getting reaccustomed to life outside of the executive branch. When offered a pint of her favorite beer — which she has called a "food group" in the past — she said, "Man, that would be absolutely great. It's as good and healthy for breakfast as it is for dinner." She offered, "Want me to show you how to pour it? ... Right down the middle. Then you give it a little rest." McCarthy also discussed more serious topics during a taping of E&E News' weekly climate podcast. She berated the Trump administration's "entire attack on science" and dared her successor, Scott Pruitt, to take on the Obama-era "endangerment finding," which underpins EPA climate rules. "I think he's going to lose," McCarthy said. She was hard-pressed to name one thing Pruitt has done at EPA that she's liked so far, and she described their only meeting — at court arguments last year when then-Oklahoma Attorney General Pruitt was attempting to overturn a climate rule McCarthy had worked on for years. The fate of that rule — the Clean Power Plan — is now in Pruitt's hands. Audio of McCarthy's full interview is available here. You worked on a lot of these policies that the Trump EPA is now planning to roll back. Does it feel like your years in the Obama administration are going down the drain? Totally! No. No, it doesn't feel like that. Certainly it feels very uncertain now, I think is the best word that I could use. And I'm not saying that there isn't some little bit of sort of personal anxiety about it, because you can't work that hard and that long and do as much work as we did to really try to make sure that we were moving forward moderately, you know, that we were keeping everybody under the tent, including the business and utilities and others, which I think we did a really good job at. So there is some personal sort of disappointment, but no, it ain't over by any means. What do you think the outcome of the Clean Power Plan will be, and do you think ultimately EPA under this administration will regulate greenhouse gases? Yeah. Well, EPA is obligated to. I mean, the Supreme Court has told us a few times, and if you look at climate science, you know that to be the case. So, yeah, EPA will regulate or Congress will have to take action, and so which happens next and whether or not the Clean Power Plan goes away is really what needs to be considered. And I don't know a crystal ball to tell me what's going to come next, but I do know that it's going to be really difficult, I think, for this administration to simply get rid of the Clean Power Plan, as opposed to, you know, remove and replace. You have to have something else in place. Have you talked to Administrator Pruitt either before or after he became administrator? Did you reach out to him, or did he reach out to you? No, I did reach out to him, but this was even before ... his nomination. I saw him at the oral arguments on the Clean Power Plan in the [U.S. Court of Appeals for the] D.C. Circuit, and he introduced himself to me. And he was very nice, and that's the first and last time I ever talked to him. Is there anything he's done at EPA that you have liked so far? I appreciated that he spoke to the employees early on, the career staff — that was good. I don't think it was quite the message I was hoping for, so that wasn't as good. But, you know, I'm not sort of tracking him and what he does on a daily basis. I'm trying really hard to remember that I'm not in that position anymore. ... I can't say that I can identify a specific thing that I'm fully behind him on, nor do I know everything he's doing. How do you describe Pruitt in private? I don't know whether I do actually describe him. ... I don't sit at my dinner table describing Administrator Pruitt to people who have no interest in the environment, you know? That would be one way to get indigestion quickly, you know? So I don't spend a lot of time actually talking about him, and, you know, I honestly think he seems very committed to his ideas and what he thinks. So I can't — I don't have any intention of sort of describing him or criticizing him personally. I'm interested in what Congress told EPA to do and how an administrator thinks about that and carries it forward. If there was one thing that you could veto that the Trump administration has done, what would it be? You've given me a laundry list of what I think are essential foods, and I have to pick one? ... They've really gone after everything, you know? That's what tells me that there's no systemic effort underway to really look at all of them, talk to the career staff, think about where your new policy influence may have changed the outcome. Did you ever think that someone who describes climate change as a hoax could be elected? No. No, I didn't ... because I always expect people to vote for thoughtful people. I think one of the most dangerous things about this administration is their entire attack on science. It's not just climate — it's entire attack on how science is done. Do people recognize you? Do people know you were EPA administrator, like in the supermarket? Well, usually they say — they are very supportive and thank me for all the work that I've done. If they don't like what I've done, they still usually thank me for my public service, which is very nice. But that's New England. That's Boston. What happens when you go to West Virginia? I don't know. ... I have been in areas of North Carolina that are very close, but that's as close as I've come. Yeah. ... It was fine, yeah. You know, I'm hoping that people realize that, you know, I'm not particularly a political person. You know, I've worked for Republicans. ... I'd really just love to see this administration understand that there are limitations to what you can bring to the table, that you can't mix politics and science. You can mix policy and science — which means you can look at the science and make decisions on the basis of sound policy — which is what you always do. But you can't deny the science in order to advance your political agenda. The endangerment finding still stands. Do you think Pruitt won't touch the endangerment finding, given that he is talking about regulating greenhouse gases at least from a minimal perspective? Even Administrator Pruitt will recognize that this issue has been addressed by the Supreme Court a whole bunch of times. And if the utilities have been successful in telling him that denial of that is actually not helpful to them to recover costs, then I think what you'll see from him is a replacement of the Clean Power Plan, which may be the only rule that he actually replaces. I don't know; that's my guess. ... I don't think you're going to see him challenge the endangerment finding. I think it's a fool's folly to go down that road right now, and I don't think that he's a fool. And that's hopeful for you, right? If there's the endangerment finding still intact, then there can be future regulations on greenhouse gases. I would be perfectly happy if he went after that, if that's what he thinks he should do, because I think he's going to lose. ... And if he wants to spend a lot of energy on a losing cause, go ahead. You know, he has to make his own choices. I just think he's smart enough to know that that is a losing cause and he would be better off regulating in some way, knowing full well that he probably won't be around when that's challenged and overturned.